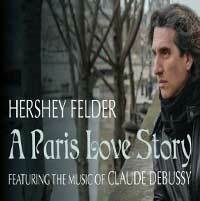 In his one-man biographical musicals, Hershey Felder has brought to life everyone from Beethoven to Irving Berlin, and in Hershey Felder: A Paris Love Story, the virtuoso performer takes audiences on his own personal journey as he explores the life and music of Impressionist composer Claude Debussy. From the sweeping La mer to the evocative L'après-midi d'un faune and the mystical Clair de lune, this soaring tribute will never be forgotten. Experience it at the Annenberg Center for the Performing Arts in Beverly Hills.